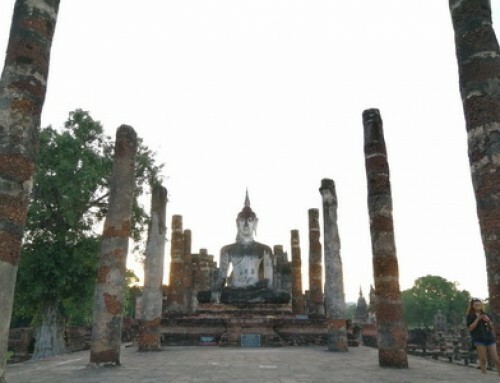 Santichon Village is one of the most popular tourist attractions in Pai. Santichon Village provides the way of life and Chinese clay houses. Tourists can taste the green tea and pork hocks with buns at Baan Santichon surrounded by the mountains of Pai. The Chinese Yunnan Village is not the typical Chinatown you see around the world. The tourists can see the conservative cultures and traditions of the Yunan People such as the language, dressing, and specially the Yunnan foods that is admired among the tourists. Santichon Village or Chinese Yunnan Culture Center was settled by Chinese people who fled the Chinese revolution of Mao Tse Tung. After all these years, the descendants still living here and adhering to traditional ways, have managed to profit from Pai’s economic upturn. Santichon Village has a population of 2000 souls of mix Yunanese, Thai hill-tribes people and former Chinese soldiers. When opium was still the mainstay of the village and old Chinese soldiers wandered the streets in their old Republican uniforms, automatic rifles in hand. Today, It’s quite popular with Thai tourists, with a large tasting area for tea, which has replaced opium as an important crop, and a souvenir market at the village entrance. Santichon Village was declared open on February 9, 2005 by Mae Hong Son deputy governor Mr. Prasit Prasertsri. Santichon Village is indeed a center where visitors have the chance to experience Chinese culture: the village showcases reproductions of traditional Chinese clay houses, and there are a few tiny shops made of mud and clay selling tea by the bag or by the pot, where they also often run tea-tasting sessions. It is also possible to experience Yunnanese way of life, as well as dressing in a traditional Yunnan dress. You can sign up for pony or horse or donkey riding, take part on shooting games, and one of the highlights of the village is the big wooden ferris wheel. Feng-Shui plays an important role in the contemporary Chinese world. As little as 20THB per person, you can go on a swing. A group of about three men use their body weight to spin the wheel. Once the wheel begins to spin, the air is permeated with the sounds of laughter and enjoyment . The real attraction in Santichon village is delicious authentic Chinese – Yunnanese cuisine and desserts. you have to try authentic Yunnan Chinese food such as pork hocks, buns, steamed black chicken with Chinese herbs, fried shiitake mushroom, Yunnan girl’s salad. These dishes come with boiled rice, and fresh brewed Chinese tea. Continuing on from the village, the unmade road got incredibly steep and bumpy. It will cost you 20 Baht each to enter the view point. The Yun Lai Viewpoint presents a gorgeous view of the green nature that surrounds the city of Pai. Yun Lai Viewpoint is on the West side of Pai, out past the hospital. Follow the red “viewpoint” signs by the roadside for about 5km. You will pass Wat Nam Hoo. After the Wat you will see a large Chinese gate covering a bridge, crossing that leads you into a Chinese Village where you are then faced with an incredibly bumpy and steep unmade road. At the top of the hill, you will be greeted by a large parking area and an earth path leading you up to the view. Chinese Yunnan Cultural Village provides reasonable cost home-stay resorts for tourists who want to experience Yunnan culture. Most homestays are built with mud and straw and are surrounded by manicured landscapes. Located in the outskirts of Pai, Mae Hong Son province, northern Thailand, about 5km outside of town. From the walking street area, take the hospital road and follow it until you reach the Bypass Road. Drive across it and continue uphill. Pass the Thai Cultural Center and 1km later you will see a large Chinese gate covering a bridge that marks the entrance of Baan Santichon – Yunnan Cultural Village. After Chinese village you can visit Nam Hoo temple and Mor Pang waterfall. This is the biggest waterfall in Pai valley and a good place to wash away the sweat and dirt of the day. Where can tourists stay in Santichon Village? Thank you.